Hey guys! What’s up? Are the winter blues bringing down you and your wardrobe? Well, I have a solution for you! In a previous post, we talked about how to cheer up our mood during winter, by adding some bright colored coats to our closets. Today, we will continue to do the same, because there is a long way to go until the days become bigger, warmer and brighter. Unfortunately, winter has still a fair amount of days on his back and our only choice is to wait patiently for spring. However, that doesn’t necessarily mean that there is nothing we can do to make it bearable! I’m about to give you some tips on how to style pastel colors during winter! Keep reading if you need a way to bring a fresh air to your moody weather looks! I personally am in an urgent need of a wardrobe lifter, because I feel already tired of the dark shades of my winter looks. I bet you do too, because you probably wouldn’t have clicked to read this post. Bright colors can certainly be a mood lifter during winter, but in case they are not your thing, pastels (or the so-called chalky colors) can do the trick in a more subtle manner. These peaceful cotton candy shades are here to add a fun, delicate and feminine touch to your looks. Many consider pastels spring and summer appropriate only, so if the idea of incorporating them into your wintertime attires scares you, this post will change your mind. Why not break the rules when you’re not harming anyone? In case you find the way to pair them tricky, I’m here to share some tips that will save you from looking like a unicorn. 😛 Shall we? These soft shades can blend really well and look really dreamy if the pairing is done the right way. That’s because the lines between the garments are much softer than the ones that occur when you color block with bold colors. But, beware that not every pastel color goes well with another! If you are a beginner at color blocking just stick to combining just two different colors in a single outfit. Some of my favorite complementary combinations are: pastel pink + pale lemon, mint green + light blue, peach + lavender, pastel pink + mint green. However, if you are fearless and love colors, go for more than two, but pay attention to which contrasting shades look the most flattering as they’re organized together. Also, one last thing to take into consideration when going for a head to toe pastel look is your skin tone. If you are pale then avoid wearing only pastels because you will look washed out. Instead, add some bright or dark colors too. Pairing the same pastel shade or pastel hues from the same color family is a guaranteed way to create a chic and polished look. I don’t know why, but there is something about monochromatic outfits that screams classy. In that case, you can play around with volume, textures and cuts. If you want to jazz it up a bit, you can play around with a bold makeup of fun accessories. Pastels are a great solution when you want to ground flashy and bright colors, but still, want to go for a colorful, fun look. They add a little softness to an otherwise edgy and bold look and this way is appropriate for more occasions. Plus you show off your unique taste in style! Can you imagine a monochromatic look, in which pastels and brights are mixed? How stylish would it look? I’m really obsessed with how pretty the combination of an emerald green hue with a pastel mint tone looks! Sounds too daring? Then what about a fuschia top with some creamy orange pants? 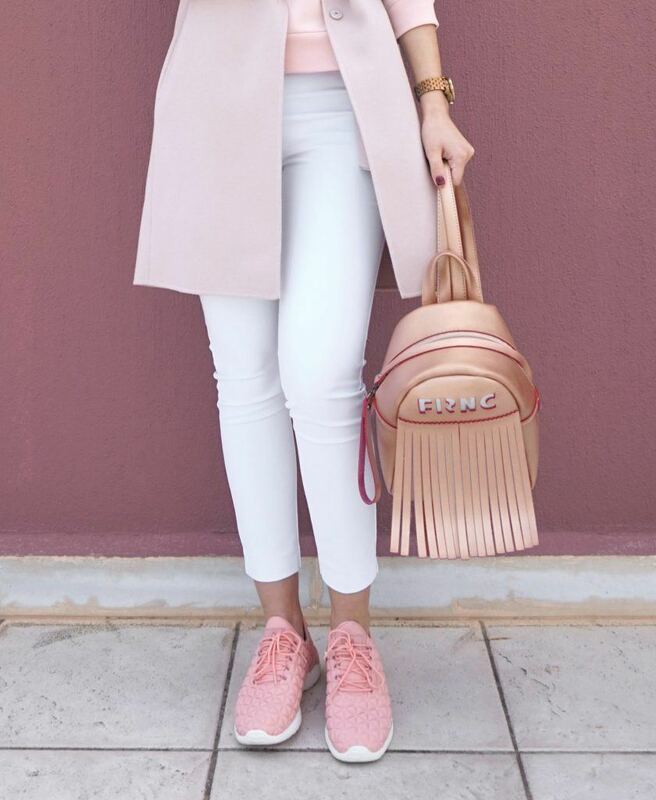 If you don’t feel like going full color, the combination of pastel hues with the soothing neutrals is one of the best ways to add a hint of color to your outfit. Beige, cream and gray go great with most of the pastel shades, so don’t be afraid to experiment with many different combinations. The same applies when combining pastels with black or white. You can never go wrong when adding pastels to a total black or total white outfit. When it comes to black, no matter how many pastel shades you match it with, its dark nature will always dominate them, creating polished and modern looks. On the other hand, white enhances the softness of pastels, giving that innocent and romantic vibe. An outfit like that is the perfect go-to summer look. However, if done right you can pull it off during winter too! If from all the advice above you thought that pastel monochrome or color blocking is the only way to go, well you guessed wrong. Pair pastels with bold, stand-out patterns for an intriguing and fun twist. Just make sure that the colors of the prints are complementary to the pastels you match them with. Also, avoid pairing floral patterns with pastel pieces, since this might make you look a bit old-fashioned. Instead, make your look modern by going for garments that feature minimal or abstract designs. Lastly, if you feel that pastels are not your thing but would like to give them a shot, you can incorporate little pastel details in your outfits like a hat, a bag, jewelry, sunglasses or shoes. This way you will add a touch of cheerfulness to your look, without betraying your personal style. Lately, I’ve realized that I own a lot of pastel pink garments in my wardrobe (waaay more than I thought I had), which for some reason I rarely wear. However, I wanted to change that and I think this head to toe pastel pink outfit just became my current favorite. It’s the perfect transitional winter to spring look (I know, I know we have a whole month until spring, but who cares?) and gives that romantic and cheerful vibe to get me through the cloudy and rainy days. What do you think? Would you like to copy it? 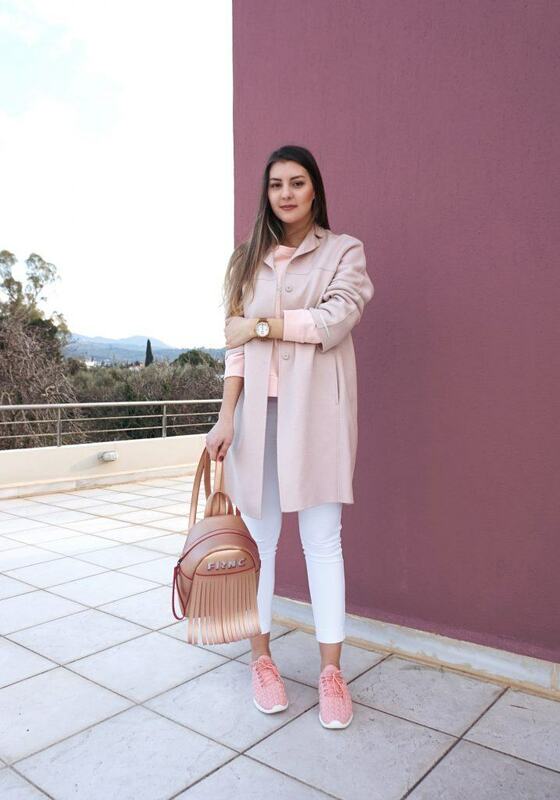 I hope this post about how to style pastel colors gave you some inspiration and help you cheer up and turn any winter look in a positive way. And just be a little patience my beauties! Spring will be there soon! OMG you are singin my tune. I adore pastels – especially pinks and lavenders. That is the dilemma I have – pastels in winters. Can you really do that? You have convinced me. Also pastels with black. This is one of the most fun posts I have read. Keep it up, you are on your way to great creations!! Amazing! Love this look! I think I need to add some more pastels to my wardrobe palette. Thanks for the great ideas! Yes you should definitely add some more! You can never go wrong with them! Thank you for your comment! I really enjoyed your website. I love the pastel ideas for winter. I recently started adding pastels in to my winter wardrobe. 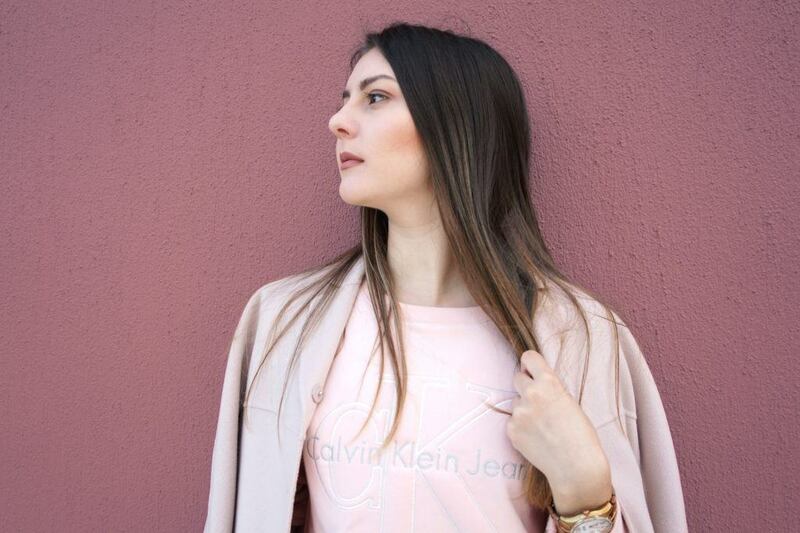 I love blush pink for a winter wardrobe. I agree that you absolutely can wear pastel colors in the winter, when paired with the right colors. I really liked the photos also. Thank you dear Endris! Plus they will come in handy for spring too! 😉 Thank you for your kind comment! As always a great article. It seems like you know what you’re doing and you’re doing it well. I can’t wait for the next one. You have my support! Thank you my dear Shay! That is a beautiful outfit! What a perfect look for pushing off the winter blues! It is, isn’t it? Thank you for stopping by! This is a great post! I love to wear pastels and have a closet full of pink. I often wonder about the best way to pair some of my favorites up in the winter months. I also absolutely adore the coat you showcase. I am curious about the warmth of it. I live in Northern New England and I need a nice coat for the winter that will stand up to the weather here! Thanks for sharing! I really enjoyed reading! Who doesn’t love a closet full of pink? This coat is more of a spring one, however it isn’t very cold where I live. You could try a heavier one, but still in a pastel color, to achieve a stylish soft look! Thanks for reading! 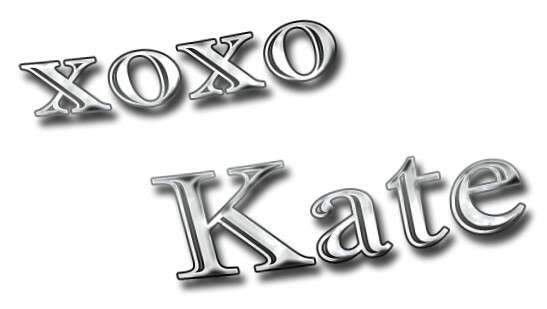 Dear, you’re amazing! I love your tips!